In keeping with Rollo’s ability to craft an incredible story, Valley Of The Scarecrow delivers top notch storytelling with all the flair of a late ’80’s/ early ’90’s slasher flick feel. The ride is intense, brutal, and never lets up. If this is what we can expect from Rollo – the future of Canadian horror is in great hands. Seventy years ago the residents of Miller’s Grove rose to destroy their devil-worshipping minister. They lashed him to a cross in his church and left him to die, resembling a macabre human scarecrow. But now the scarecrow has returned to life and is hungry for his revenge. From the beginning of the novel, Rollo sets out to let the reader know that he is still in top form, introducing a cast of characters that are not only faithful to the genre’s expectations, but also the dependable keys to a great story. It’s through these characters that Rollo brings a new slant to the whole “slasher” camp, making the reader feel like they’re part of the story – instead of feeling like you’re just reading one. The story makes you feel like you are watching one of the “classics”- something in the vein of Friday the 13th, The Burning or Sleepaway Camp – as opposed to reading a novel, making this a very worthwhile experience. This can be directly attributed to Rollo’s killer dialogue and the creative way he spins his characters. It’s refreshing at the same time as it gives the reader a sense of nostalgia for the aforementioned ‘slasher’ days. Valley of the Scarecrow reads like a vivid campfire tale. It is the type of campfire story that will have you squirming in your sleeping bag and jumping at every little noise outside the tent, yet you feel the need to tell it over and over again. Rollo’s prose finds a way to slither its way into your subconscious with vivid imagery and unnatural violence. Rollo describes the abandoned village and its long dead (or so we thought) inhabitants with an eerie beauty. You will smell the sweet ears as you walk through the massive cornfields and you be overwhelmed by the musty claustrophobia of the long deserted church. Rollo has a rare talent for this type of graphic description which makes Valley of the Scarecrow so much fun. The monster featured in this novel is incredible. Joshua Miller is the stuff that nightmares are made of, namely for the fact that he just jumps off the page and straight into your head. He is the walking, stalking embodiment of evil and the reader has a front row seat as we witness the transformation of the good reverend. Rollo has taken something that has been used for years – the Scarecrow – and made it scary again. 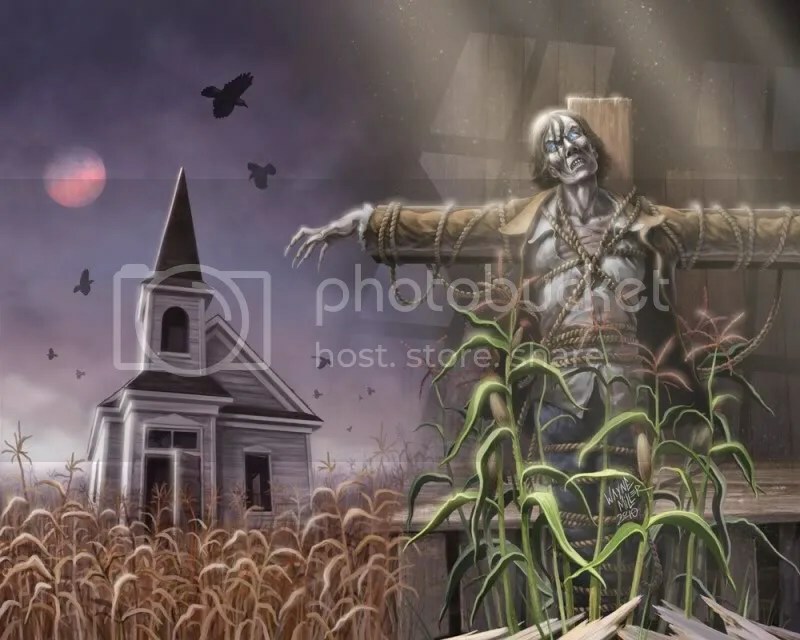 The very idea that a scarecrow would come to life and chase someone is terrifying enough, but add a religion-fueled, righteous indignation makes it all the more terrifying. Couple that with Rollo’s innate ability to create some seriously traumatizing scenes depicting some seriously disturbing monsters, and you have what I like to think is the stuff of true terror – done properly. I don’t know who/where he comes up with this stuff, but I’m hoping it keeps up. The book is fun and depraved while moving at an unrelenting pace. It truly is everything a genre fan could want. Valley of the Scarecrow shows the work of a very mature and talented writer. Rollo has the knack for creating images in your mind that tend to linger and haunt you for quite some time which makes this quintessential Halloween reading. This entry was posted in Novels, Reviews and tagged Gord Rollo, Valley of the Scarecrow by Pat Dreadful. Bookmark the permalink. Easily one of the top ten books I’ve read this year, and given the awesomeness of the titles I’ve gone through, that’s saying a lot.